Our range of products include veterinary bolus and veterinary heet bolus. 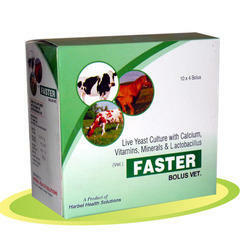 In our large line of products we are offering Veterinary Bolus. Formulated with high valued herbs and ingredients, our medicines are very useful to assure good health to animals. In addition to this, our doctors strive to develop the medicines and effectiveness. The Veterinary Bolus are delivered after a stringent quality tests and therefore. Live yeast culture : 1500 mg.
Vitamin B1 : 10 mg.
Vitamin E : 10 mg. 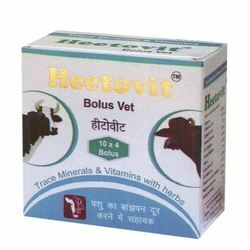 The Heetovit Tablet offered by us is used to treat various diseases of animals. This range of Veterinary Drugs is formulated with only quality-approved ingredients which are obtained from famous vendor base of the industry. We maintain hygiene in the formulation and packing process of the Veterinary Drugs tablets. Hence, our tablets are known for longer shelf life and effectiveness. Vitamin E (50%) 200 mg.
Lysine Mono HCI 20 mg.
Selenium as Sodium Selenate 50 mcg. Looking for Veterinary Bolus ?